It felt very odd standing at the paddler briefing at the GB selection event. Lots of Team GB track suits and athletes who's faces I recognised. They must have wondered who I was, standing there in my cycling 'race team' kit ( I hadn't bothered buying any canoe specific kit yet). Only my boat shoes confirmed that I probably hadn't turned up to the wrong briefing! "Is everyone ok with the starting mechanism?" Steve Harris ex world champion and head of the para canoe program was asking. I hesitated, then reluctantly put my hand up. There was an awkward moment when all the other Athletes eyes seemed to turn to me- the only one in cycling kit. "Im not sure how it works" I said. I had just admitted out loud to everyone that I was a newbie and that I had never been in a race. The day was precisely organised. Every athlete had to do 2 water 200m time trials, an ergo test and I, as a new athlete was to have my para athlete classification medical as well. It was time to head out for my water time trial - I wished my legs would stop shaking with nerves as I walked over to my boat. To my surprise, my coach had put my name in large letters across the bow making me smile which also seemed to calm my legs down a bit. Ready steady.... Last week I had capsized and frightened myself comprehensively by being unable to breathe in the freezing water as I struggled to swim to the shore. This image was not helping! At the end of the time trial I was too out of breath to smile but I knew I had done my best. I was really pleased that A. I hadn't fallen in and B.despite being cross eyed had managed a vaguely straight line (not as easy as it sounds) I also felt it was a decent time. But was it good enough for the team? My coach was grinning, he had been right. That games-maker he met in the coffee shop 2 months ago was a para-canoeist (even though she didn't know it yet). I had posted the fastest time of the day out of all the girls, including those already on the GB team! Yaaaaaay! Not only that, I had received my official para classification enabling me to be a LTA classified athlete. I had had mixed feelings about putting myself forward to officially classify my 'disability' Admitting to this disability, in my mind was a failure. I had struggled on in denial trying unsuccessfully to race my bike, becoming increasingly frustrated and depressed with my weak leg limiting me. I was really very down about it until I was given this opportunity to do something completely different. It was as if a light had gone on in my head and I had something positive to work towards again rather than standing at a dead end trying to 'ride my bike through a brick wall'. One door closes but another one opens, and classification (despite being something I didn't want to be true) was the key to that door. I had made it! In seven weeks I had managed to achieve the squad selection time! The official email followed welcoming me onto the GB squad with a list of dates- including the world champs 2013- to keep free.. I keep having to re read that email just to make sure. It doesn't seem possible that a chance meeting in a coffee shop at the Olympics (see my olympic legacy post) would lead to this. I still can't believe that I made it onto the GB squad never having raced a canoe and having spent nothing on canoeing except petrol and precisely £ 6.99 on a pair of boat shoes! It just goes to show that anything is possible if you are open to change, want it enough and have the correct support around you. I could never have decreased my time to get squad time without the coaches at Wey kayak club and of course Colin the Games-maker/GB coach who saw beyond the lopsided cyclist. Working at the Olympics had been an amazing experience, but not for any of the reasons I could have predicted. 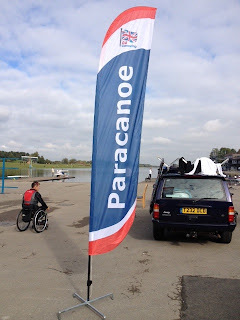 A chance meeting and a casual conversation in a cafe with a random fellow gamesmaker turned into an invitation for me to try out for the GB squad para canoe team. This was meant as a joke but his coffee was soon forgotten as I received a fast and furious Q and A session about my back injury, my weak leg and my bike racing history. He left me feeling slightly giddy with a date in my diary to be assessed for suitability to join the team. In the time it had taken to eat half a muffin I had gone from frustrated endurance cyclist with a dodgy leg to a possible GB para sprint canoeist. I was trialling for team GB in a sport which I had never done- did I mention that bit?- I've never actually been in a canoe. I arrived at the water sports centre and met the gamesmaker who was now wearing his team GB coach polo shirt looking very official. He was talking to the other athletes and suddenly I felt like I was in the wrong place. They were all in wheelchairs and I couldn't help wondering What the hell was I doing here? My legs 'work' and I can't canoe!! It was explained that there is a spectrum of disability classification for each sport and I am at one end, having reduced use of my leg, whereas they are at the other end having use of just arms. First things first-to learn how to 'paddle'. I had a swift half hour session on the ergo (dry land canoe) - I had no idea how complicated it all was. "right, let's see what you can do. " As an endurance cyclist I'm all slow twitch with weedy arms so a 200 meter sprint at full pelt on the ergo put me into a whole new world of pain. Despite my time putting me 17th in the world for my category which I was actually ok with, it was a 'disappointing' time. In order to make the team I would have to be within sniffing distance of a medal on the world stage! Then moment I had been dreading- actually getting onto the water. I start off down the lake and massive a smile spreads across my face, I work!! My arms, unlike my legs are equal and for the first time since my accident I don't have to struggle or concentrate on walking. I feel free, I feel like I'm flying! whoaah! Plop! It was 7 weeks ago that I was given the challenge by the GB coach to turn myself from slow twitch sloth into a fast twitch cannon with guns of steel. I was told that I had to drop a considerable number of seconds to be any where near the selection criteria. So much has happened in the last 7 weeks. I have been training, paddling, working and sleeping and not much else. I have open blisters on my hands, aching shoulders and quite scary looking biceps. I have learnt the difference between a Kayak and a canoe and stopped mixing up the words paddling and peddling! This weekend is crunch time. I have a total of about 2 minutes racing time and a medical to determine my path for the next 4 years, and whether Im going to be paddling towards Rio.